Cupcake wrappers are REVERSIBLE which will allow you two coordinating pattern options with each set. Create a beautiful cupcake tree, set at each place setting as a party favor, etc...the possibilities are endless. Use all one design or alternate design on your cupcake stand. Wrappers are for presentation purposes only - not to bake in. Our cupcake wrappers are a unique and beautiful party idea! Easy to assemble. Simply bake or buy your favorite frosted cupcake, hook cupcake wrap together, place your decorated cupcake inside the wrapper. 2 1/8" bottom wrapper diameter, 3 3/8" top wrapper diameter, and 2 1/8" wrapper wall height. Made of food safe material. 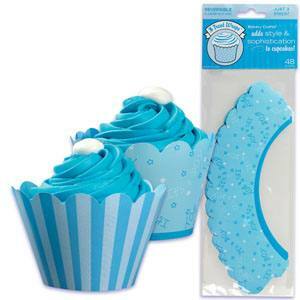 Cupcake wraps fit standard size cupcakes and the wrapper size is adjustable. If you need expedited or International shipping, please contact us.